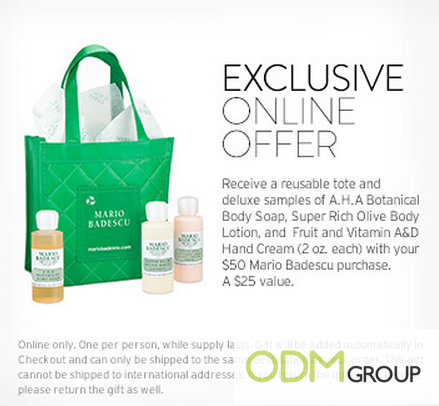 Be environmentally friendly with this reusable tote from Mario Badescu! Mario Badescu is offering an exclusive online offer at Nordstrom; this gift being offered is a reusable tote that comes with deluxe samples. The tote is a very well designed and it does not look like a freebie at all! This offer is only available for a limited period of time; so do make sure you check it out! Mario Badescu is a Romanian-born skin care specialist that possesses a unique perspective about skin care. He has created a line of beauty and skincare products that well loved by celebrities worldwide. Why offer a recyclable tote as a free gift with purchase? Reusable totes are amazing marketing gifts because customers will be able to use them repeatedly. Furthermore, not only are the bags useful, they are also trendy looking as well! Mario Badescu has designed the tote in a lovely shade of green and with a quilted design all over the front of the bag. This bag is designed so well that it does not look like just a reusable bag and can be used for as a handbag as well! People these days are getting more interested in being environmentally friendly and helping to save planet earth. Thus by offering these ‘green’ products, it will help to attract the customers that are interested in this! It also helps to portray the company as on that is socially responsible. With such an eye-catching and attractive promotional product, this reusable tote is sure to capture the attention of many. When the people show interest in the tote and are drawn in to take a closer look at it, they will get to know about your brand! Coca Cola’s Zipper Recyclable Bag as Marketing Campaign! How To Boost Sales With An Eco-Friendly Gift With Purchase?